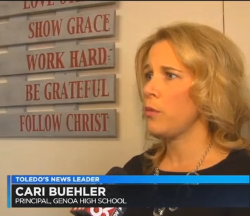 The interview was on WTOL in Toledo, Ohio and the screencap below shows the religious sign. 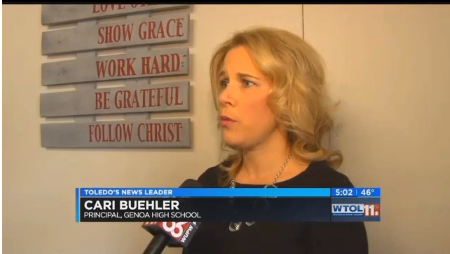 The interview took place at Genoa High School and was confirmed by the reporter who did the story. While the message on the sign is inspirational to some people, it has no place in a public school. Religious messages should be at church or in the home. It is our understanding that a sign hanging in Genoa High School reads “FOLLOW CHRIST.” An image of the sign is enclosed for your review. 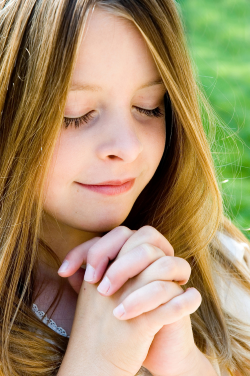 It is unconstitutional for Genoa Area Local Schools to encourage its students to “Follow Christ,” in effect encouraging non-Christian students to convert. We write to request that this sign be removed immediately. The District violates the Establishment Clause of the First Amendment to the U.S. Constitution when it allows its schools to display religious symbols or messages. This religious display is particularly inappropriate given that nearly 30% of Americans are non-Christians, either practicing a minority religion or no religion at all, and about 44% of millennials are non-Christian.” The display alienates those students, families, teachers, and members of the public whose religious beliefs are inconsistent with the message being promoted by the school. Clearly the sign needs to be removed. I will let you know of any updates when I hear about them. Happy National Day of Reason! 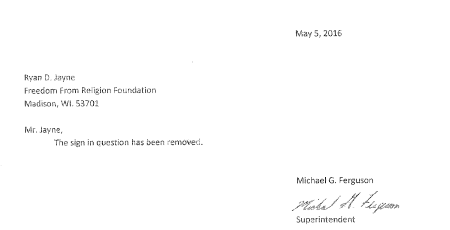 FFRF was notified today, 5/5/2016, which happens to be the National Day of Reason, that Genoa schools removed the “Follow Christ” sign. The sign in question has been removed. FFRF was also informed that students at the High school seem to be selling T-shirts to “save” the sign. As long as the school isn’t leading that action then there is nothing wrong with the sale. You can teach and display Muslim precepts. You can have “wear a hijab” support days legally, but do not dare to mention Christ. FFRF is silent here. This newly hijacked America is morally empty and religiously discriminatory. Unfortunately, not equally discriminatory even where laws apply. Your arguments do not hold water in my view. Learning to draw the early fish symbol used by Christians will never take place in schools, nor will wearing of yellow felt “star of Davids” with “Jude” imprinted on them as in the German holocaust. “What you do not want done to yourself, do not do to others.” – Confucious, could hang on the front door of any school, but if we quoted “…Love your neighbor as yourself” it would not be allowed because it is a quote from the Bible.“Do not unto others which would cause pain if done to you.”would probably be acceptable because the author Mahabharat was a phlosopher and “I will be as careful for you as I should be for myself in the same need.” would surely be acceptable because it is quoting from the “Odyssey” by Homer. You could surely suggest that young people follow the advice of any of these quotes, yet only the Bible quote would be excluded from public display. It seems that there are people who are bothered by certain sources of good advice… as if some voodoo within it might be catchy and I believe that this sign is such a case. Your stand on leaving the sign as is, but removing “follow? 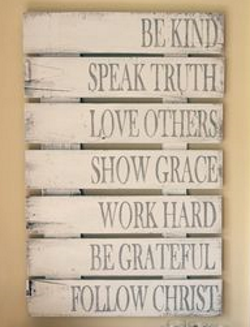 So you can’t have a sign that says: “Be kind, love others, speak truth, show grace, work hard, be grateful.” _ Christ, but it could be credited to a philosopher and be alright? I doubt those were said by Christ. If you have the bible verse were he says that let me know. If the sign did attribute the words to Christ and that was the only sign with that message then it would still be a problem in a public school. If it was part of a display of inspirational messages by different people then it might be okay. It would depend on the context. Deflection the question was not “Is this a quote from Jesus?”. If you have an example of a school exhorting its students to wear a hijab or encouraging them to become Muslims, why don’t you inform the FFRF and ask them to intervene? Giving a hypothetical example of something that may or may not happen, with no evidence that it has, is not an argument for displaying this sign in school. I’m a Christian myself, and a teacher, and I would be extremely uncomfortable if my school’s administration decided to display something like this. It’s not appropriate in school. I was challenged that stories should not be hypothetical. Maybe we should let others read the news as reported and decide for themselves. I’m not afraid you won’t believe it, only that you’ll never get the chance to decide. Sorry Doug, #1, this is not a “news” item, it’s an opinion of Snopes. #2 your posting skipped by the first 15 paragraphs to post only where you found justification for what you believe. You have clearly shaved a large portion out of the context of this report. EVEN SO, the very basis of the story’s headline, QUOTE: “Claim: Students at a middle school in Tennessee had to transcribe a portion of the Shahada.” is considered “TRUE” by Snopes. This lends credence to the original report after all. Snopes never says the claim nor the supplied photo of the directive to write “Allah is the only God;” are false claims. It actually describes them as true. Near the end of the interview the teacher states that they did discuss Islam for one day. How do you discuss Islam and not discuss religion… Islam is “a religion”? TO AMY, this WOULD BE a good source to look over while considering what is true and what’s not as both sides of the discussion have weighed in. #1 I was pretty clear I included the item from snopes as an example of stories going around the Internet – an example you’ve still failed to provide when asking us to believe that Christians are being discriminated against in public schools. #2 In general, as snopes points out, the stories have SOME truth to them in this case the students were asked to translate a portion of the Shahada BUT the difference here is it wasn’t put up as a sign by the school outside of the educational context nor did the teachers make any truth claims about the Shahada. They didn’t teach the students the statement was true only that it was part of the Islam religion. They weren’t demanding the students believe the statement or in the religion. It wasn’t being used to provide inspirational support like the “Follow Christ” sign. The stories are out there, both about teaching the five “Pillars of Islam” and in wearing of the hijab in support of Islam in schools and at school functions. In case you think the hijab is not a religious issue, find stories defending Muslim reasoning for wearing them in driver’s license pictures. Just for clarification, I am anti all religious precepts being taught in school. I am not against the teaching of moral behavior no matter who you’re quoting. Teaching the five pillars of Islam isn’t proselytizing any more than teaching that the Pope is the head of the Catholic church. It’s a set of, “Here is what Muslims believe.” Schools do the same thing when they teach about what the Know-Nothings believed, what the Shakers believed, what the Puritans believed. If this school had said, “Christians believe Jesus is the son of God,” that’s not proselytizing either. But when they change the statement to “Follow Christ,” it’s a huge problem. And I have never, EVER heard of a school posting or teaching an Islamic equivalent of that. Again, if YOU have a SPECIFIC EXAMPLE please share it. Telling me “the stories are out there” leaves us with the conclusion that you either can’t find or can’t be bothered to find actual, concrete examples of a school promoting Islam. And you can’t, because they don’t exist. Update: There is now a very large duplicate sign on private property where all the students can see it when they drive to school and the principal can see it from her office window. There are hundreds of tee shirts and yard signs on order. 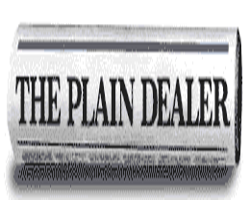 The people of Genoa, religions and non-religious alike do not appreciate someone with a letterhead and fax machine in Wisconsin telling us what we can and cannot do and have come together for a common goal. You lose, FFRF, you lose. I didn’t know you spoke for the non-religious too. The principal put the sign up and it has been removed. FFRF was successful in the request as it should. The sign had no business being promoted by a school or administrator. The issue wasn’t the sign itself but the fact that the school had put it up or allowed it to be put up outside the current legal views of various state and federal courts. It a huge one is on private property and students are wearing t-shirts with the sign is not a violation and is in fact how religious expression in a public school is suppose to work. Jennifer, a school should be teaching the Constitution, not ignoring it. Their job is to teach, not proselytize. How would you feel if it said “Follow Mohammed?” The people defending her now would burn down the school if she were pushing Islam. FFRF has not lost at all. The students—and you, apparently—are missing the point completely. FFRF’s objection is to government speech. All they want is for the GOVERNMENT to not promote religion. Signs saying “follow christ” are appropriate on private property, including students’ shirts, but not on the wall of the school. This demonstration unwittingly underlines FFRF’s victory.